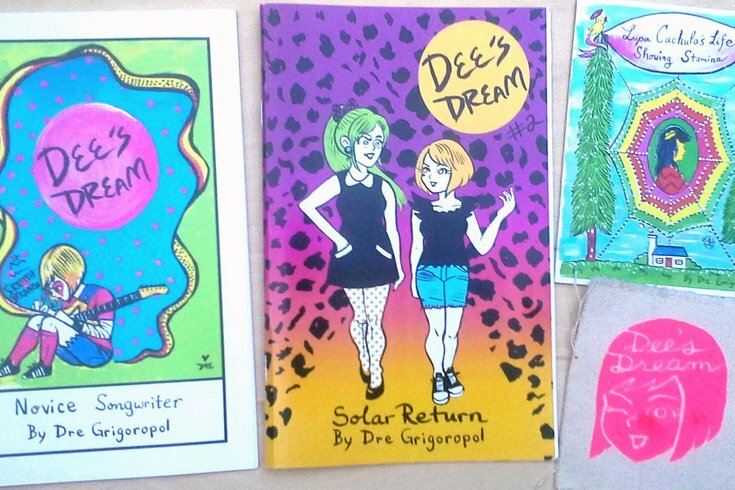 Self-published pieces by Dre Grigoropol. Now in its 14th year, the Philly Zine Fest seems to thrive on its niche nature, gathering artists and writers from all over to celebrate the joys of self-publishing. The 2016 edition welcomes Taryn Hipp (creator of“Lady Teeth”), Elliott Junkyard (“The Adventures of Vampire Kitty & Space Bat”), Rachel Hays ( “RAHPOWERS”) and lots more creative people whose stuff you don’t like only because you haven’t seen it yet. This is your chance. I talked with local artist/writer/zinester Dre Grigoropol — co-organizer of Philly Zine Fest — about the enduring power of the medium. I think a lot people assumed the web would kill the paper zine. Why do you think they persist? People like the idea of zines being something to read without looking into a blue screen. Studies show that peering into a computer or smartphone screen is bad for your eyes, while reading from print is fine. I think that we all retain and remember a lot more of what we read from print. It is also nice to have objects you can hold onto. Zines are small press or self-published, making them rare gems that resonate more closely with their readers. Deadlines are harsher when working in print. Something on the web can be edited or altered at any time. Making work for print is more like writing on stone. You’re very prolific, with several self-published titles to your name. How do you get so much done? What time of day do you usually work? What do you listen to while you work? To get a body of work takes a long time, so I find it is best to set aside time to focus on my projects. My work gets done mostly alone, although I am a fan of drawing alongside other cartoonists. I love to create in the morning with coffee or tea, but most of the time I can’t do that, so I work at night. I listen to indie bands and tune into college radio while I work. Other creatives, oddballs, quirky situations and everyday life are different pieces of the puzzle of what I find inspiring. Who are you looking forward to meeting at this year’s Zine Fest? I hope to meet new friends, other exhibitors, future collaborators and interesting people. Sunday, Aug. 28, noon-7 p.m.